Freshen Up Your Cleaning Routine with Lemons! Lemons are great for cleaning. Did you know that lemons are great for eco-friendly cleaning? Due to their low pH and citric acid content, lemons are fabulous at safely bleaching, disinfecting, removing soap scum, eliminating hard water stains, and more! In fact, many cleaning manufacturers know this and often employ citric acid and/or lemon essential oil, which has antiseptic, antimicrobial, and bactericidal properties, in their formulations. But you can easily whip-up your own green cleaning recipes with lemons and lemon essential oil at home and save some cash while you’re at it! Lemon juice is also heavenly when combined with a little baking soda to create an easy scrub in the kitchen that will naturally bleach and disinfect your sink without the need for using toxic, chlorine bleach cleansers. You can also use lemon essential oil, which is a top essential oil used in green cleaning, to create a non-toxic powdered or creamy scrub cleanser that you can store under your sink, such as this do-it-yourself Aromatherapy Cleanser and Earth Friendly Disinfecting Cream Cleanser. 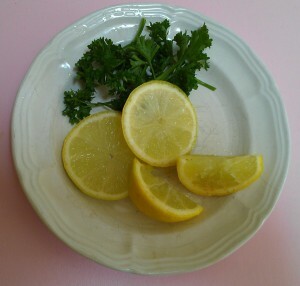 For some more great ways to use lemons to clean, check out my About.com article, “10 Bright Ways to Use Lemons to Green Clean” and enjoy using this safe, non-toxic ingredient for your cleaning needs. How do you use lemons to clean? Copyright © Karen Peltier and Well Gal, 2013 – 2018. All rights reserved. Photo © Karen Peltier and Well Gal, 2013 – 2018.